How Do I Introduce New Cats Peacefully? If you’ve got two (or more!) kitties, you want them to be the best of furry friends! But, cat introductions can be tricky; as our pets are naturally territorial, they won’t always react peacefully to a newcomer! Luckily there are lots of things we can do to help new cats get along well, without too much stress or aggression! Slow introductions, plus lots of preparation and support are key. The tips below should help your new kitty pals get along! Before a new cat arrives in the house, prepare a separate space or room as a new kitty safe space. Be sure to let your other resident cats access the rest of the house - just not that room. It’s important to give new kitties at least a week to adjust to their new area, free from other animals. When you first bring your new cat home, take them to their own safe space right away. Leave them in the carrier with the door open, and give them time to explore. Don’t force your kitty to come out! Your pet will investigate when they are calm and ready. As part of your kitty preparations, make sure there are enough resources to go around. 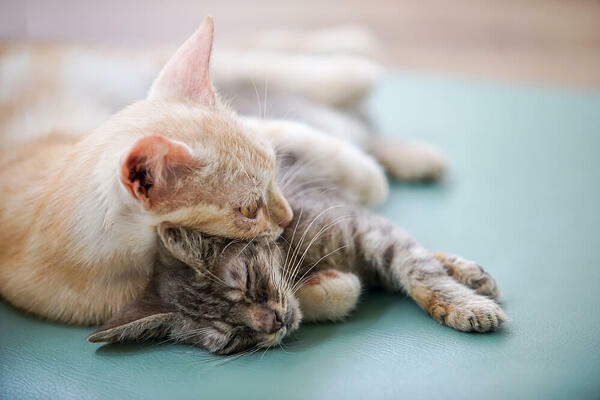 Cats don’t like to share their things; not having enough food and water bowls, litter trays or hiding spaces can create kitty tension and conflict. You should have one of each type of resource per cat in your household (plus a spare!). Play and reassurance are very important to make sure your pets are happy and feel safe! Setting aside bonding time (at the same time each day) with both your new and resident cats (separately at first!) will maintain your relationship with both kitties and will help to ensure a relaxing and positive atmosphere in your home. Once your new cat feels comfortable and safe in their room, it’s time to make a first kitty introduction - through scent! Your pets feel safe when surrounded by their scent, and they will start to learn about each other through smell. To make a ‘scent introduction’, try swapping blankets or bedding from where each cat has been sleeping. Swapping food bowls will also help your kitties learn more about each other, while associating the scent with the positive experience of eating. If your kitties respond well to each other’s scent, it’s time to let them see one another! With your new kitty still in their safe room, open the door just enough to let your resident cat see inside but not enter. This way, the two can see each other and meet; they may sniff each other, stare, or walk around with tails up. If the meeting goes well, and both kitties are calm, reward them with treats! But, if one or both cats seem stressed or unhappy, keep the introduction short, and gradually repeat later. It may take a few sight introductions before you’re sure your pets will react well face-to-face! If visual introductions are going well, you can open the door to the safe room or remove any barriers you have had in place, and let your kitties meet and investigate! Start with a short introduction at first, and gradually increase the time your pets spend together. It is normal for your pets to be a little nervous or hesitant at first, and there may be a little hissing. However, it’s important to watch out for fights! If your pets are hissing constantly, showing signs of aggression or they fight, you should intervene - by clapping or making a loud noise - and separate them. It may be that the encounter was too long, or that they are not quite ready. Take a step back and try again another day with a new (short!) introduction, then repeat until they are more tolerant of each other. It may take many short meetings before your cats are happy to be near each other unsupervised. This may take several weeks, so be patient! Be sure to keep a close eye on them even once they seem friendly - there may be a few conflicts, especially if resources need to be rearranged so both cats can access their own spaces. It will take a little while to adjust! To give your cats the best chance at a friendly, peaceful relationship, FELIWAY CLASSIC Spray supports a calm, relaxed environment and reduces stress between kitties! Sprayed on your new kitties carrier, it can help to reduce stress during their big move to your house - and sprayed on prominent objects around the house, it will help to reassure your pets while they get to know each other!